The preparation stage of InfoComm 2015 is quickly coming to a close while manufacturers and integrators begin to anticipate the biggest trends they will see on the show floor this year. Walking the show floor at InfoComm each year, it’s fairly common to hear conversations around “what we’d like to bring to the table next year,” so it’s no surprise that companies are well prepared for this year’s show. Now, the wait is almost over—we’re only one month away from the industry’s biggest event, and manufacturers are busy putting together the last of their ideas to bring to InfoComm 2015, held this year in Orlando, FL, from June 13 to 19. Of course, attendees at InfoComm each year also anticipate the trends, technologies, and discussions that occur over the week, so they can use the information they gain to help build their business the rest of the year. InfoComm is a one-stop shop for the latest in industry trends. Over the years, we’ve seen the rise of 4K, network audio, unified communications, and more, as they start as a discussion and develop into a technology that transforms the industry. Manufacturers are constantly working to create and adapt to new standards and trends, with the hope of providing integrators with a more comprehensive solution to their needs. With this precedence, manufacturers are coming into InfoComm this year looking for the newest technology trends, so they can better understand where the industry is headed and incorporate that knowledge into their latest products. This year, Matrox’s focus will be on demonstrating that latency is the final frontier in AV distribution over IP, to Samuel Racine, director of sales. 4K is still gaining a lot of buzz leading up to InfoComm this year, with both manufacturers and integrators looking for ways to incorporate the UHD format into their products. Already, we’re seeing more and more Ultra HD/4K-ready products coming to fruition, but this doesn’t mean that integrators need to prepare for disruption or higher costs for clients looking to incorporate 4K into their projects. Bob Caniglia, senior regional manager, Eastern North America at Blackmagic Design, explained that going into InfoComm this year, attendees should keep their focus on network trends to learn new ways to adapt 4K into their installs. “They need to be thinking about products that are going to work together across a network, from capturing, switching and recording, to streaming and archiving. Integrators also need products that are expandable and provide room to grow workflows. Features like the ability to work in SD, HD, and Ultra HD are helpful because they help to future proof the product,” Caniglia said. With standards like Dante, AVB, and HDBaseT playing larger roles in installations, integrators need to stay informed on how to implement these into their projects. Learning the latest tech trends at InfoComm is just step one—integrators must also keep up with the latest markets and their demands, and find ways to incorporate the new technologies into the field. The collaboration between AV and IT continues to tighten the gap, causing manufacturers to develop products for those markets. “As AV solutions continue to converge more closely with IT-based infrastructures, it’s extremely important for integrators to take advantage of the benefits gained by using networked media systems (NMS) as a tool for networked system requirements. Evolving away from isolated, analog systems, the NMS approach uses the assets of a client’s ethernet network to transport media while sharing both processing power and networking resources. As a result, integrators can maximize system capabilities, simplify overall administration, and support simultaneous applications throughout entire facilities without complicating the AV system design process,” explained Shell Haffner, director of product management, Biamp Systems. Growth in unified communications is also exploding, according to Revolabs director of strategic and channel marketing, Randall Lee. “Revolabs created the FLX UC product family to answer the needs of this burgeoning trend. We’re most excited about introducing Info- Comm attendees to the newest members of this line, as well as debut a new line of wired and gooseneck microphones,” he said. Corporate AV is another area that manufacturers are directing their attention toward, which requires them to develop solutions for boardrooms, huddle rooms, and the like. “These meeting room technology solutions are powerful, yet elegant systems that integrate modern telephony and soft codec conferencing technology, DSP-enhanced sound reinforcement, third party device integration, and automated control,” said TJ Adams, project manager at DSP products, QSC. Over at Contemporary Research, they are developing tools for the entertainment markets, another growth sector in the industry. At InfoComm 2015, Gefen will offer attendees the opportunity to experience real-world 4K Ultra HD gaming action with a live racing simulator at its booth. Possibly one of the most anticipated aspects of the InfoComm show each year is its packed schedule of educational and training sessions, geared toward helping AV professionals maintain knowledge of the industry’s trends and technologies. However, you don’t need to find a classroom to get the most out of your educational experience, as many manufacturers on the show floor are ready to enhance attendees’ learning experiences at the booth. Crestron’s director of global marketing campaigns, Jeff Singer, said he hopes attendees learn more about how to interact with IT professionals moving forward. InfoComm 2015 is set for June 13 to 19, 2015 in Orlando, FL. Leading up to the show, SCN will highlight a range of training sessions, interviews with InfoComm leadership, commentary from integrators and consultants, statistics, infographics, and more. SCN is proud to announce that the finalists for the 2015 SCN Installation Product Awards are out! For more information, turn to page 43 and be sure to visit avnetwork.com/scn0515 to read more about the finalists and to cast your vote! Keeping up with the rapidly-changing world of AV can be a challenge. Luckily, InfoComm offers a hub for professionals to attend training sessions offered by manufacturers, so they can bring the knowledge of the latest technologies out into the field. Gordon Moore, Lectrosonics vice president, sales, and chairman of InfoComm’s Professional and Education Training Committee, added that InfoComm’s training sessions can help professionals stay in touch too. “These courses are aimed at keeping you well-grounded in the basics while keeping you on the cutting edge of the industry and where it’s going. CTS certifications will prove to be more and more valuable as the pertinent technologies continue to advance,” he said. * Vaddio is offering two classes this year: “Simplifying Your Automated Lecture Capture Classroom,” which discusses the improved PC-based soft-clients and new AV automation technology for the classroom; and “Gamma, Chroma and Detail Oh My… The Video Ins and Outs,” which covers the camera systems Vaddio offers, what they are used for, and how to recommend which one. * Shure will host a session titled “Wireless Mics, The New Spectrum Landscape,” on June 18, led by systems support engineer Gina Sigismondi. On June 19, systems support engineer Dave Mendez and product manager Doug Danbe will give an in-depth look at Shure’s Microflex Wireless. * Alcorn McBride will offer a two-day product training class that will cover the basics of the company’s audio, video, and lighting products, along with its show control systems. Equipment is provided to give trainees a hands-on experience. * Digital Projection Inc. will host two classes this year: one on the successful deployment and characteristics of a 4K projection application, and a second on presenting a deep-dive on the topics of projection warp and blend and advanced projection control. * Vitec will offer a CTS-certified RU course titled “IP Video Distribution & Monitoring—Systems Design and Implementation,” presented by Robert Mautino, senior systems engineer. * Meyer Sound will host three training courses: “Principles of Live Mixing,” with instructor Buford Jones on June 17; “Mix It Up—Live Audio Workshop,” with instructor Buford Jones on June 17; and “Deploying Large-Scale AVB Networks,” with Jeff Koftinoff on June 19. 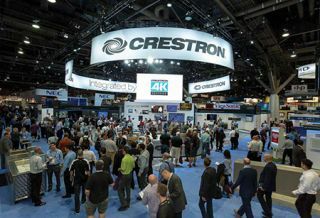 * Crestron is offering several manufacturer training courses during InfoComm that cover the latest technology integrators and consultants’ clients are asking for, from managed AV networks and group collaboration solutions, to 4K distribution and enterprise management.